Lord Jim O'Neill, who advised the government on antibiotic resistance, said he was shocked by pharmaceutical companies failing to tackle drug-resistant infections. He said the solution may be to "just take it away from them and take it over". The pharmaceutical industry said it was not standing still on the issue. Bacteria evolving resistance to antibiotics threatens to take medicine back to the dark ages. Some infections could become untreatable and losing the drugs would make surgery and cancer therapy far more risky. It is known as the antibiotic apocalypse. Part of the solution is developing new drugs, however, there has not been a new class of antibiotic since the 1980s. The problem is there is simply no money in it - any new drug would need to be cheap and used rarely to minimise the risk of resistance. Three years ago, Lord O'Neill proposed solutions in his Review on Antimicrobial Resistance, including giving pharmaceutical companies around a billion dollars for each novel antibiotic they developed. Lord O'Neill said that since then there had been empty words from global policy makers and that he was coming round to the idea of, in effect, nationalising part of the pharmaceutical industry. He told the BBC: "If you had asked me three years ago, I would have thought that would have been a bit crazy. "But nearly three years after our review came out, there's endless talk but there's no progress in waking up the pharmaceutical industry to want to do this. "So, by default, I find my mind thinking why not explore the idea of some public utility that's got public-purpose ownership of it, just take it away from them and take it over." He said that companies ditching antibiotic research would be an opportunity for a new public body to acquire those assets. 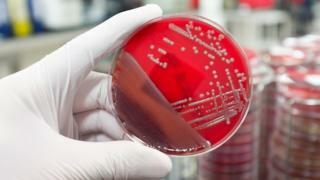 The Association of the British Pharmaceutical Industry (ABPI) said it was "hardly standing still" in the fight against antimicrobial resistance. Dr Sheuli Porkess, the deputy chief scientific officer at the ABPI, said: "Nationalising antibiotic development simply won't get us the antibiotics we need. "In 2016 the private sector invested around $2bn in research and development of new antibiotics, roughly four times as much as all government and foundations combined." The ABPI said it had been working closely with government for the past two years and companies were "ready and waiting" to test a new model for supporting antibiotic. "We shouldn't write off this plan before we've tried it," Dr Porkess said. However, there is wide agreement that developing new drugs will only ever be part of the antimicrobial resistance solution. The practice of handing antibiotics out like sweets will continue to fuel the rise of drug-resistant infections.